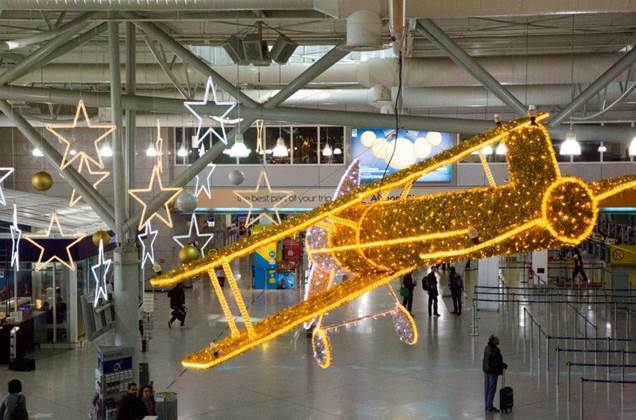 Athens International Airport will celebrate this Christmas & New Year’s eve with classical holiday tunes, a magical Christmas ball and a group of dancing mascots! A joyful snowman, the Nutcracker and Santa Claus’ reindeer will be at the Departures Level (free access area) from 9:30 to 14:30 offering Xmas cards and holiday greetings to passengers and visitors of the airport, entertaining children and posing for photos. Between 10:00 – 15:00 at the Departures Level (free access area), a “celestial figure” will give life to a magic ball through special choreography and acrobatics and present a spectacular show with touches of winter magic. Between 13:30 – 14:30 at the Departures Level (Airport’s Shopping Center), 32 young artists from Alimos Music School will present a special festive musical program of carols and all-time-favorite Christmas and New Year’s classics. The airport’s holiday events are part of the Fly me to the Moon/Musicport project, an Athens Airport cooperation with the culture platform ελculture.